“Caledonia” G-AKGH her first flight was on September 1, 1949, She was Delivered on November 15, 1949. 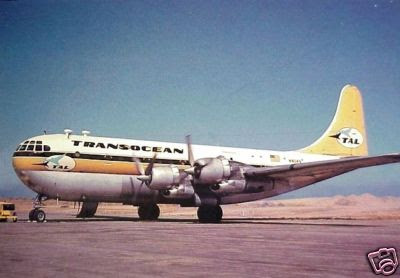 She was sold to Transocean , August 1958 and registered as N137A, then re registered as N402Q. On September 1, 1960 she was sold to Airline Equipment Company. And in 1963 she was sold to Aero Spacelines. In 1969 she was destroyed in a ground accident at Mojave, Airport. Calif.
Captain Andrew, who was to fly her home, was on the same Constellation flight as myself on the way to America and Canada—we were thus acquainted in advance. During the extra day one of the jobs was to study the detailed delivery instructions from which details are extracted. (a) Delivery captains are required to ensure that they themselves and their crew are fully conversant with the instruction and to confirm to the Flight Captain before leaving Seattle that they have read this instruction and have conducted a crew briefing meeting upon it. (b) Once the aircraft has taken off from Seattle it comes under the normal control of the stations through which it passes and of the overall control of Sub-Line Control at Montreal and Line Control, Filton. (c) The normal delivery route is Seattle-New York (Idlwild), Gander, London and Filton. Where applicable. Line Standing Orders are regarded as governing the general operation. Aerodrome Limits are a. specific exception. The route followed between Seattle (Boeing Field) and New York (Idlewild) is that used by N.W.A. via Spokane, Minneapolis and Chicago, i.e., Green 2 to Love Rock, Red 14 to Aurora and Green 3- to New York or, avoiding Chicago, via Green 2 to Milwaukee, Red 57 to Toledo and Green 3 to New York. Although Gander is included in the New York-London section, the direct flight may be made provided weather permits and fuel requirements are adhered to. There then follows a proposed time schedule and details, of availability of fuels, carriage of passengers, communications procedures, diversion, navigation and catering orders. Limits for flight planning for all airports on delivery flights are 8ooft and two miles. For actual landings, at the discretion of the captain, C.A.A. limits for Constellations plus 200ft and one-half-mile may be used. Captains with under 100 hours' experience on Stratocruisers fly to standard limits plus 200ft and half-a-mile. We arranged to forgather at the B.O.A.C. office on the airfield edge at about eight o'clock in the evening, local time, after taking a last dinner in the city. In addition to the crew and supernumeraries there were a few B.O.A.C. representatives—including Mr. Ed. Townsend, Mr. Condon and Captain Burgess—and half a dozen or more Boeing passengers. (13) Wing flaps checked? First Officer: tOut 10 deg on emergency, then off. In on normal, then off." (15) Pitot heaters? Captain: tChecked and Off." (16) Torque line heaters? Captain: On." (17) Navigation lights checked as required? (18) No smoking" and seat belts" [indicator switches]checked? First Officer: On." (19) Radios? Radio Officer: Checked." (20) Engineer's pre-flight check? Engineer Officer: Completed." (21) Amount of fuel, oil and A.D.I.? Engineer Officer:" . . . lb fuel, oil, turbo and A.D.I, tanks checked, caps secure." (22) Pitot covers and gear locks? Engineer Officer: Off and stowed." (23) Cabin secure? Steward: Cabin secure, cargo doors closed, ship's papers aboard." The complete check took about eleven minutes this first time, but with practice it will be much quicker. Next came starting-up, in the order 3 and 4 then 2 and 1. Engines are numbered one to four across from port to starboard. It went something like this: Engineer Officer: All clear to start No. 3, Ground? " Ground had previously pulled each engine through eight blades to check for hydraulicking (oil collected above the pistons). The engineer officer prepared all controls with fuel selectors at tank-to-engine position, one booster pump on, mixture control at fuel cut-off, throttles at 800 to 1,000 r.p.m., turbo override switches at take-off, starting selector on 3, and so on. 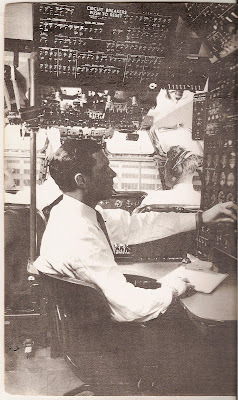 The First Officer, looking back at number 3 engine, called out " One, two, three, four, five, six, seven, eight blades, Eric." Whereupon Eric put the ignition switches on and, after a turn or two more: Engine firing—keep it going." Forward went the mixture control and a little extra throttle seemed to help at first. This procedure was repeated until all four Wasp Majors were running smoothly and quietly behind us. Nine after-starting checks were called out and five more for before taxing, but at this point a considerable drop in the level of the hydraulic-fluid tank (upon which I was sitting) had been noted and reported to the captain; after a moment's consultation it was decided to close down and remedy the matter. The hydraulic tank, situated behind the engineer officer's panel in the cockpit, had been changed during the day and the system drained. The new tank had been refilled but the system had remained empty; consequently, on starting-up the engines, the tank was almost emptied to fill the system. A gang quickly arrived with mobile hydraulic-fluid pump, and some three gallons of cold fluid were slowly persuaded to pass through the filter in the tank filter neck. There was a good deal of homely Anglo- American natter as instructions were passed back down the line: " A bit faster . . .take it easy . . . STOP! . . . now a bit more ... speed 'er up a bit . . . more . . . STOP! " And so we got our fluid. The next start-up went smoothly and quickly, and by mid-night we bad taxied out to the run-up position. There were all the usual checks, together with turbos, airscrew reverse-pitch and others as well. Finally, the 23-item take-off check was called out, starting with all windows secure and flaps25 deg," and ending—from the engineer officer—with standing by for take-off." [In the next part of this article the flight home will be - described.] First refueling of Caledonia at Idlewild Airport, New York, and (right) the engineer officers supervise the operations. Seattle to New York : Impressions in the Air : A Change 0/ Airscrews —first the main wheels, then the nosewheel—started to climb before circling the city and setting course for the east. Caledonia's first take-off in the hands of a B.O.A.C. crew—for there is no acceptance test—was smooth and occa- sioned the minimum of action from the pilot. For a start the captain took the nose wheel control and throttles and the first officer the wheel, while the engineer officer followed up on his throttles. An order from the captain and the engineer completed the throttle movement, while the captain, as the rudder became effective, took over the main controls. The maximum take-off power—3,500 b.h.p. per engine with A.D.I.—was used. The corresponding boost and r.p.m. are 58m and 2,700 r.p.m. Only the built-in supercharger is employed for take-off, the turbo- blower being for use at altitude. The speed mounted, 75-80 kt, 90-100 kt, and the first officer called V.1," the speed above which the take-off is continued even if an engine fails or below which engines are shut down, pitch reversed and brakes applied. The V.1 speed varies with load, and on our take-off from Seattle with 132,000 lb a.u.w., it was 98 kt with rudder boost in use ; at full load it is 109.5 kt. Next, " V.2 " was called—the minimum speed for holding direction following an engine-cut. This is equivalent to the three-engine safety speed for the load concerned. 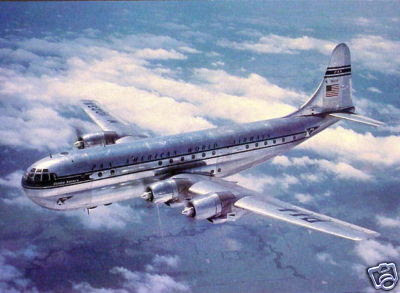 Take-off power is maintained on the Stratocruiser until it is established in the climb, and the gear is on the way up. After this, rated power (2,800 h.p., 2,550 r.p.m.) is used at 140 kt until 200ft is reached and, thereafter, climbing power at 165 kt climbing speed. Normal climb power is held with the aid of the turbo-blower at 50m manifold pressure. The last 10,000 lb of weight up to the 142,500 lb maximum makes a pronounced difference to the feel and length of take-off ; e.g. and loading must also be watched very closely at full load. The aircraft is inclined to nose- heaviness. 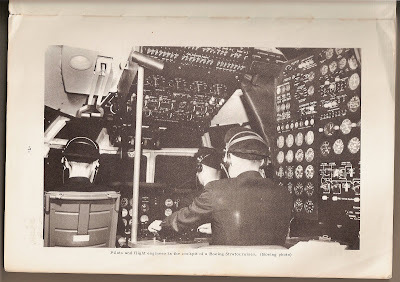 The magnificent cockpit had impressed me from the start; and now, having seen the crew installed and working in complete comfort, and having experienced a night take-off sitting beside the first officer and with a supemumary captain seated beside the captain, I realized that in this feature at least the Stratocruiser exhibits superior qualities which no crew will wish to relinquish again. The only aircraft I can remember with anything like the space, comfort and view is that Rolls-Royce of old bombers, the Short Stirling. As Caledonia circled Seattle to the right, the huge greenhouse nose offered an unsurpassed view up, down, ahead, sideways and even to the rear. It was quiet enough to talk freely and easily, the ride was smooth, and the temperature was comfortable. The initial climb following a long take-off seemed a little sluggish, but, as height was gained, so the aircraft got into its stride and the rate of climb seemed to improve. An average rate of about 700 ft/min was maintained. 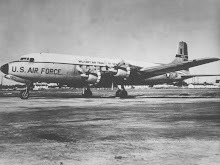 Caledonia at Hartford, the home of the United Aircraft Corporation. Later, as we continued to climb, I walked back into the cabins and made a careful check-up on noise and vibration levels. The two main cabins I found very pleasant, the sound of engines and airscrews becoming more and more remote towards the tail. In the small front cabin and in the toilet compartments (which coincide with airscrews and engines) the noise and vibration are considerable. This, one feels, should be the subject of further examination with a view to improvement. The cocktail bar, however, is per- haps the most comfortable spot of all, and here one can sit and chat as peacefully as in a hotel lounge. It is said that the Stratocruisers wag their tails, and this is true—true, in fact, of almost all large and long aircraft, particularly those with a single fin and rudder; but this effect, and the counter-shudder felt by the crew in the nose, are experienced only in rough air. At the intended cruising height of 25,000 ft there should be little or nothing in the way of turbulence. .. . . No Boredom After this preliminary examination in flight I moved forward again towards the cockpit, having sensed that we had leveled off, and it struck me as significant that only about two of the dozen or more passengers—by no means all seasoned air travellers—had remained in their seats after take-off. The others were wandering around, chat- ting, examining the passengers' instrument panel, or taking a drink below. This was something new ; in my experience of aircraft with which the Stratocruisers will compete, the odd passenger who does anything on a long trip but sit and read, sleep, eat or looked bored, is an exception. These people were not bored and did not become so during the whole of the 9 hr 5 min flight. Admittedly, several turned in on the roomy and comfortable bunks for an hour or two of sleep. I later had a refreshing three hours on an upper port-side bunk myself. Arriving in the cockpit, I noticed that we were flying at19,000 ft at maximum w.m. cruising condition. This I knew to represent 1,750 b.h.p. per engine. Moreover, we were riding in and out of cloud and picking up some ice. 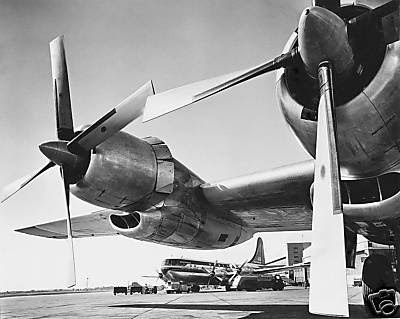 It seemed that although the Stratocruiser would climbwillingly to 28,000 or 30,000ft, it would not hold more than about 19,000ft on the permitted cruising power until the weight had gone down a little. At this time we had covered about 240 miles in a little over an hour. With the wing-inspection lights on and thermal de-icers working we watched the ice disperse from the hot parts and heard small lumps fly of the airscrews. More built up, however, on spinners, parts of the nacelles and around the aileron hinges. Soon some slight tail-buffeting could be felt on the controls, and the speed dropped by about 20 kt; so, the crew having little experience of icing with this new aircraft, it was thought prudent to lose height over Spokane and call up for clearance on track at a new height.The ice had mostly gone when the new clearance came through as we circled the area of the city at about 11,000ft. While iced-up we noted a loud, continuous hooting noise above the cockpit, and came to the conclusion it was caused by ice forming on the short radio-aerial masts. It may be desirable to keep these coated with some sort of anti-icing preparation, for the noise was irritating and distracting. It was a great privilege to have been given the freedom of the ship for the long flight home, and one which enabled me to study the conditions of flying from both crew and passenger viewpoints. For the next few hours I settled back and enjoyed being a passenger. Aperitifs and a mealwere served, and later a party of passengers took an early- morning nightcap in the bar. Afterwards I turned in and slept well except for an interruption when part of the heating system stopped working on my side of the cabin. This was nothing very serious, but it is to be hoped that the Stratocruiser is not going to be still another airliner in which an apparently good air-conditioning system proves temperamental. Incidentally, now that these aircraft have started their first operational winter, the heating for the pilots may need further study. The huge expanse of glassmakes the nose portion very cold at 25,000ft, and on one occasion I personally found my legs and feet becoming uncomfortably cool after sitting in the first officer's pew for about half an hour, with the autopilot in control. The captain agreed. On the transcontinental trip (the route of which was included in the map accompanying last week's instalment of this article) we got our first glimpse of scenery between Chicago and Toledo. Before this, only pin-points or patterns of lights during the night and cloud at dawn had been visible below. Captain Andrew made a long, shallow descent towards Captain Alan Andrew is greeted on arrival at London by Captain A. S. Wilcockson, who was Captain of the first Caledonia, a Short C-class flying boat. the helicopter. It also provided me with a magnificent air tour of the north shores of Long Island Sound. And so the time to take leave of the North American conti-nent came round. We had a little farewell party in the restaurant and looked longingly at the stacks of chocolate bars, the food counters, and the slot-machine nylons as we walked through the temporary buildings to the aircraft which had arrived back an hour or two earlier from Hartford. efuelling was complete, and everything had been stowed away ready for the flight. We were assured of quite good weather and a strong tail-wind for most of the Atlantic crossing. The intention was to fly in one hop to Shannon (which, on a great- circle route, takes one near to Gander) and possibly, if winds were sufficiently favourable, to overfly Shannon and go non- stop to London. The take-off from the long, well-illuminated runway was exactly as before—a precision procedure, as it should be—and quickly we climbed up through layers and patches of cloud. Until we neared Gander, flying on the range, the cruising height was again 19,000ft, but as soon as possible we climbed up by stages to 25,500ft, which offered the best compromise in cruising conditions, tail-wind advantage, and keeping clear of the upper cloud-layer. Conditions at this time, as I noted them from the firstofficer's seat, were: height, 25,500ft; 2,200 r.p.m. ; 38-39U1 boost; indicated air-speed, 190-195 kt; outside air temperature, -31 deg C (corrected for -7.6 deg compressibility error); torquemeter, 190 lb. The engineer gave me the air-craft weight as 117,500 lb. Making a few calculations, the corrected air speed turned out to be 282 kt, and the navigator confirmed that with the 45 kt tail-wind the ground speed was 327 kt. From torquemeter pressure, a constant and the r.p.m. (190x0.0043x2,200), the output per engine worked out at a fraction under 1,800 b.h.p.—a little over the 1,750 at present recommended but under the makers' quoted figure of r,9oo b.h.p. : Operational Economy If full advantage is to be taken of the Stratocruiser's per-formance it is important that the full cruising power of 1,900 b.h.p. be available for use as soon as possible. This will permit a higher cruising altitude from the start of the journey with full load. It remains to be seen whether Stratocruisers can operate as economically as their older competitors on the North Atlantic route. Certainly they will have the great advantage of being able quite frequently to cut out intermediate stops on the west-east flights and of being able to fly east-west atfull load without a delay for refuelling in Iceland. Passengers bound from London to New York do not take very kindly to stops at Prestwick and Gander, let alone an additional one in Keflavik in the small hours of the morning. By 7.30 hr Z we were 19 minutes ahead of schedule, and if the favourable wind continued right across, a single hop" with a chance of a record time was quite possible. Once we were well established on the North Atlantic leg of the flight I returned to the cabin for dinner, first watching the steward and stewardess in action in their new galley. It seemed to me that they had insufficient room to lay out meals or stack used trays and dishes, even for the limited number of meals served on this occasion. Certainly practice should improve matters, but it may be necessary to ask all passengers not to pass the galley when meals are being served, and also to provide some folding shelves in the recess leading to the main door immediately opposite the galley, for use during mealtimes. Seeing coats and hats folded on unused seats also reminded me that 110 coat-hanging space is provided in the B.O.A.C .layout. The mid toilet-compartment might well be replaced by hanging space if full aircraft are expected, for I feel sure few passengers will care to use it in its present exposed position and with its present dimensions. This is not to say that an additional toilet is not required at the rear, particularly if the layout is to be kept flexible with two-class travel in mind. Could not, perhaps, one of the places on the rear triple-seat be sacrificed in favour of a rear toilet behind the steward's desk? The lack of space for hanging coats is also apparent in the crew compartment, and here again the possibility of modifying a toilet compartment—something less elaborate would satisfy most crews—so that better clothes-hanging facilities could be made available, might well be an improvement. As we flew on through the night sky, clear now of all upper cloud and bright with moon and starlight, I realized how much I was enjoying the flight on the Stratocruiser. This employment had been increased by the free, friendly spirit which had existed all along among crew and passengers. There is, of course, a corresponding camaraderie in r, ship—a feeling of all being in the thing together—and the same regret on having to disembark at the journey's end. A visit to the cocktail bar seemed to have its points, so down the stairs I went. The mirrors at the forward end help to give an impression of spaciousness, unavoidably offset to some extent by the cramped (though probably adequate) little bar and food lift each side of the door to the aft freight compartment. One must look behind the mirrors, which can be folded down, for undercarriage emergency retraction. Provision is made for two flap motors to be removed bodily, if need be, and attached to the undercarriage winding shafts. The luggage compartments are all pressurized and accessible in flight; in fact, the only three portions of the fuselage not pressurized are the nosewheel box, central wing area and tail cone. Elaborate precautions against fire 1 have been provided, immediate warning being given by carbon monoxide and smoke detectors. Masks and oxygen a-e provided for emergencies, to enable the crew to locate and extinguish afire among freight and baggage. So sensitive are the CO. detectors that they have to be desensitized when the aircraft is on the tarmac or awaiting a turn to take off, because the carbon monoxide from the exhaust of other machines in front will give a false warning in the aircraft. With these and other thoughts in mind I decided once more to sample the comfort of the roomy bunks, and remembered nothing more until bright sunshine flooded through the small upper porthole and Ireland was less than an hour away. It seemed that the helping wind had died out midway across, and so we were to make a routine landing at Shannon. In fact, we flew in over the damp, deep-green Irish fields—each unbelievably small after the vast expanses of Canadian ranches and American farms—and touched down at 11.56,after 9 hours 18 minutes in the air. Of the hour and three-quarter flight on to London after breakfast there is little to say. The ride was smooth and comfortable, and our American friends were most interested to see the Brabazon assembly hall—though no Brabazon as we flew over Bristol. A wet and hazy Heathrow soon came into view, and with the minimum of delay we were down and cutting engines on the tarmac. Crew and passengers were subjected to a brief and orderly immigration, health and customs examination ;then, as the passengers embarked for London on the coach, the B.O.A.C. crew prepared to fly their flagship back to base at Filton.